Over 50? Yes You Can Be Faster Than Ever! This plan is designed for the age 50+ road cyclist. The goal of this plan is to develop your skills and abilities to maintain a competitive race fitness, even as we age. This plan gives you just enough of a variety to keep your strengths sharp, and build and improve your limiters. The plan covers all facets of cycling fitness that will benefit criterium, road racing, time trialing, and even cyclocross and mtb racing. If you do not race, but are looking for a way to get stronger and faster to handle your club rides, a century or a Gran Fondo, this plan will work well to give you new levels of fitness and speed. The plan is built by USA Level II Cycling Coach and Cat II road cyclist Paul Ozier. Paul has over 25 years of racing experience and more than 15 years as a cycling coach. 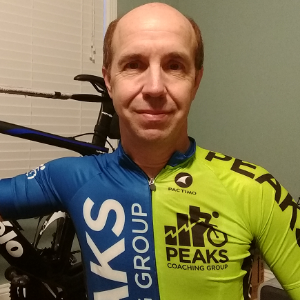 Paul is a full time Elite Coach at Peaks Coaching Group. Athletes coached by Paul have excelled to new levels, set personal bests, won races for their first time, and taken home Silver and Gold medals in state championships. This is a 12 week plan. Average Weekly Training Hours 7h:55m. Longest week is 11h:05m. For most of us over 50, we need more rest and recovery so we can nail the intense days with finesse and quality. Unfortunately, we are not in our 20s anymore. We need to have intensity to keep that edge, but also enough recovery so we are feeling fresh and chomping at the bit so we can have those stellar workouts that really tell you that you nailed it and benefited. FTP Shots. Short above FTP intervals with minimal recovery. Duration goes from long to short, but watts go higher as you progress. Total of 33 minutes continuous on and off intervals. End with 12 minutes at Sweet Spot (SST). You will really be feeling the early work. 3 x 15 minutes at Tempo. On the first effort ride at 75 rpm, the next at 90 rpm, the last one at 105 rpm. Rest an easy 5 minutes between each effort. If you want to push through and do a straight 45 minutes at Tempo that is fine, but be sure to change cadence at each 15 minute mark (75, then 90, then 105 last). Easy zone 1 mostly, some zone 2 OK, just easy to loosen up. VO2 Max for 3 x 3 mins, 95-98 rpm, rest easy 5 mins between efforts. Then get in one 5 min SST effort. Cadence on all try for 95-100 rpm. Nice and smooth, nothing too hard. This is a great short workout to get the legs and body opened up for the next two weekend days of riding. 30s, VO2, FTP - Push It! Warm up 15-20 minutes. Include 3 or 4 x 30 seconds fast pedals at 105-110 rpm, zone 2 and 3. 7 x 30 seconds at 140-150% of FTP, 95-100 rpm. Begin these when you are rolling at 18-20 mph. Stay seated and punch the throttle. 30 seconds rest between each. 3 minutes at 110-115% of FTP. Really push hard on this one to hold your power. 15 minutes at 100-105% of FTP. This one will hurt, push through the pain and hammer it home! Let's finish today with 5 x 30 seconds; Do these with a standing start from about 10 mph. Nail the pedals for just a few seconds until the bike is rolling quickly, sit down and finish the effort strong. Max the power as best you can. 30 seconds rest between each. Now just put in a few more miles to get to 2 hours in the saddle today. Cool down 10 minutes easy pedaling. Go out for a nice solid 2 hours endurance today. Keep the legs moving. Nothing too hard, no sprinting. Keep under FTP on hills. Stand and fall easily on the pedals without using force on the hills. The goal is to keep the watts in endurance with a solid, steady ride. 7 x 1 minute @ VO2Max - Build to power quickly and smoothly. These DO NOT require a hard sprint type launch. 1 minute very easy between each interval. Let’s do 3 x 20 seconds sprints from speed (18-22 mph) and at a 80-85 cadence. These will be a hard, quick and sharp explosion to get on top of gear quickly, then sit and spin to 110-130 rpm before shifting. These are smooth, powerful, fast legs. 3 minutes very easy between each one. Ride 5 minutes at an easy active recovery pace. Nail it hard, out of the saddle, launching the bike for 15 secs at max effort, then sit and hammer out 15 seconds at VO2Max, now relax and settle in at Zone 4 watts, powerful, nice and smooth, for 3 minutes. At the end of 3 minutes stand and sprint out a hard 10 seconds to put the icing on the cake.